When you need cabinetry or display cases for your commercial space, you want a product that lasts. You also want a product that helps you achieve an attractive atmosphere for your customers. To get what you want, you need woodworking professionals. You need Westwood Cabinets & Store Fixtures. When you choose Westwood Cabinets & Store Fixtures for your custom woodworking, we take the time to understand your needs. We review the specifications for your cabinetry, slatwall displays, display cases, etc. and incorporate the textures, designs and patterns you favor into our designs. We craft durable products, and we provide service—installation, repair and restoration—for the lifetime of your woodwork. Commercial spaces have special considerations when it comes to designing cabinets and other store fixtures. In addition to fitting custom spaces and achieving a unique look, commercial woodworking needs to provide resistance to microbial growth. Westwood Cabinets & Store Fixtures uses commercial-grade ¾” melamine, a non-porous surface that prevents the build-up of bacteria and other allergens and pathogens. 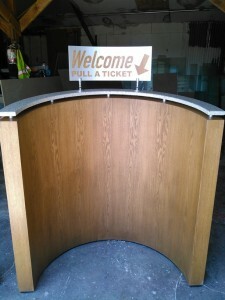 Of course, we also work with other hardwoods and exotic woods as well as provide a wide range of veneers, finishes, acrylics and other materials. No matter what type of commercial display you need, Westwood Cabinets & Store Fixtures can do it. Contact us to get started on your woodworking project with a free consultation and quote. Contact Westwood Cabinets & Store Fixtures for the highest quality custom woodworking!